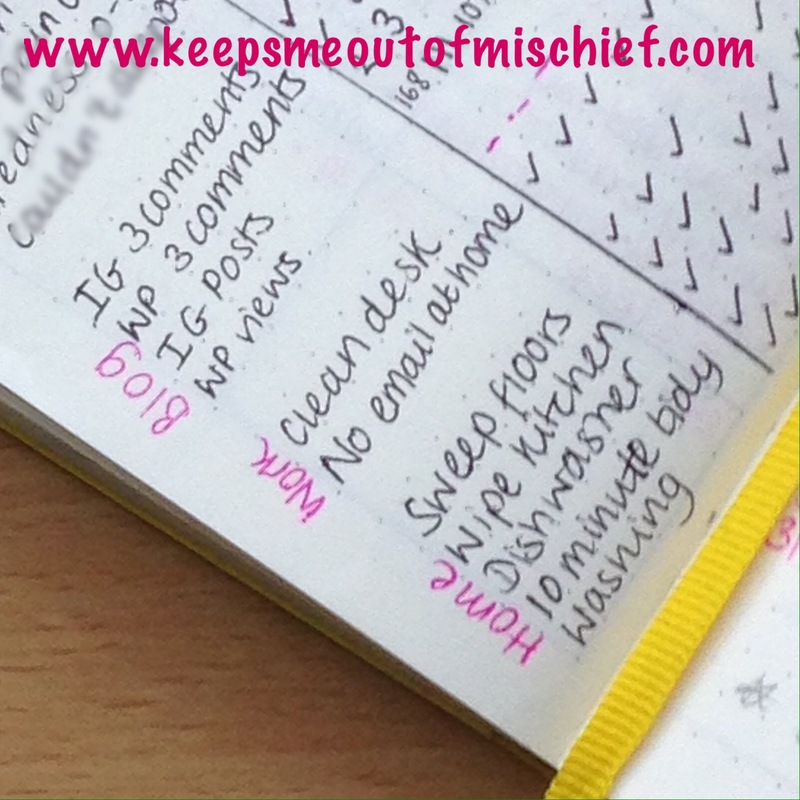 Using a Tracker for Repeating Tasks | Keeps Me Out Of Mischief! If you’ve been following this series since the beginning of the year, you’ve now been using a Bullet Journal for a month. That’s pretty good going and you should have a really good idea if it’s going to work for you. Keep asking yourself the review questions from the first few posts to help you to tweak your system. Today we’re going to think about those tasks that you keep finding yourself writing, whether it’s every day or a few times a week. They’re the mundane tasks which just need doing and you really don’t want to forget! You’ve probably found that the act of writing these tasks down has had a positive effect and you’re completing them more often than you would have before you introduced a Bullet Journal into your life – wanting to put a tick in a box is pretty motivating! I originally used a method of Post-It flags which were marked with recurring tasks. Although this method worked well for me it didn’t allow me to track how often a task had been done and didn’t have the motivational effect of a box to tick to show that it had been completed. Bullet Journal tracker pages are all over social media and have massive potential for the different things that you might want to track. I find it so helpful because it means I’m not repeatedly writing out the same tasks, thus saving time and I can see how often I’ve carried out each task. The dates for the entire month are written across the top with the tasks down the side, I keep one of my bookmark ribbons on this page so that I’m reminded to check it regularly. 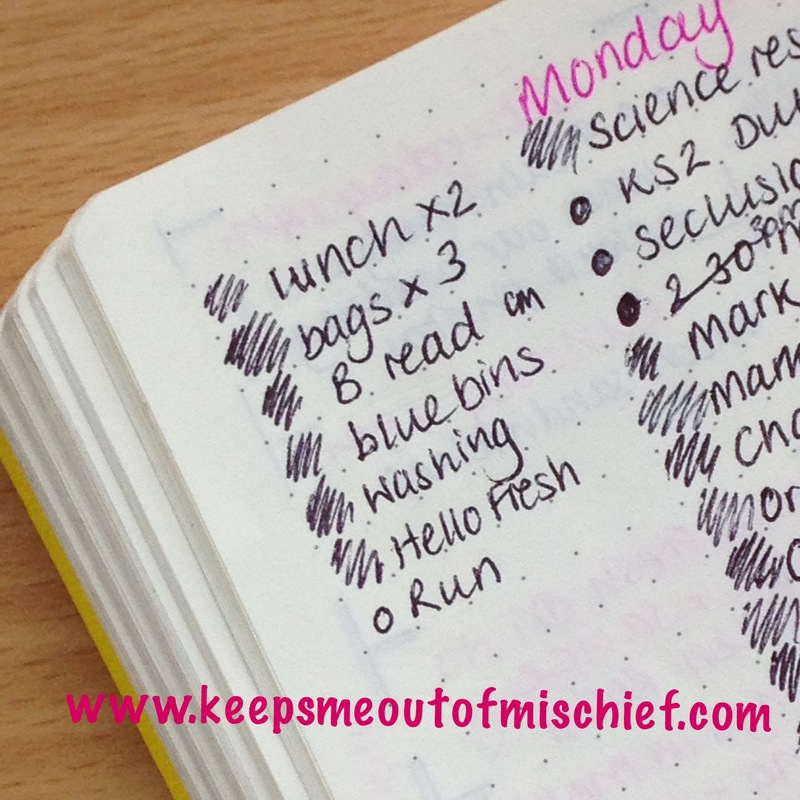 Have a look at your daily entries, what tasks do you find yourself writing repeatedly? 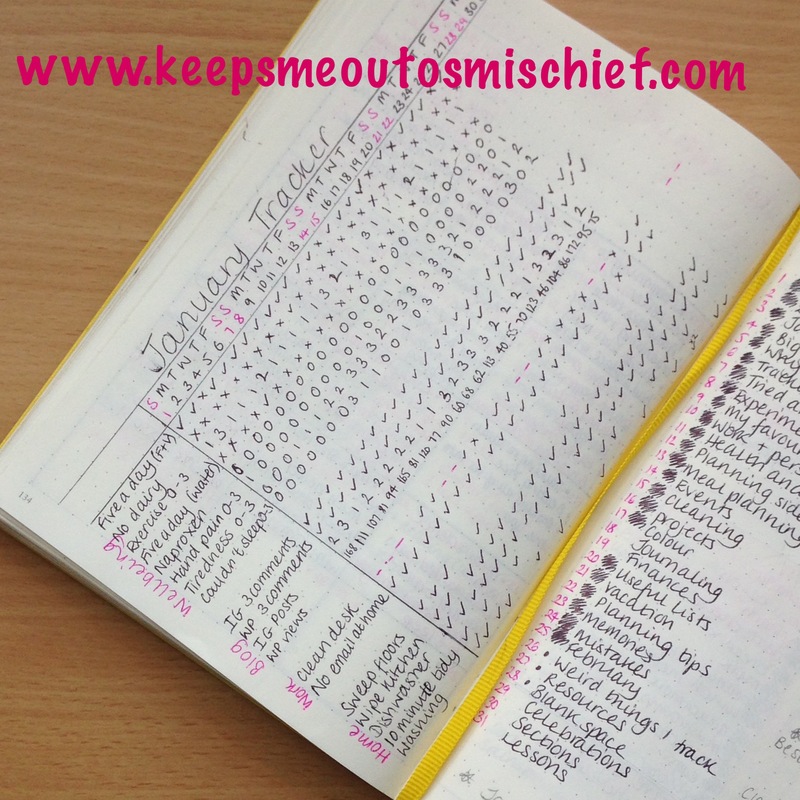 Why not set yourself up a tracker page for February, you might find it really useful- let me know if it works for you! Part 1: How to Start a Bullet Journal. Part 2: To Migrate or Not to Migrate, That is the Question. Part 3: Using a Legend to Organise Your Day. Part 4: Long Term Planning in Your Bullet Journal. I love using my tracker I designed for myself. I tried having little symbols at the bottom of my daily page (like a water cup for drinking) but I found that the best type of tracker for me to use is a monthly one, and I can track lots of different things on the same page….after all sometimes not drinking my water leads to having a headache!! I used to track my water intake and was really good for a while, then i stopped tracking and I stopped drinking enough. Definitely bringing it back in February but it will be part of my daily list, I need it in front of me all day long! I find that they really keep all those necessary tasks on track!